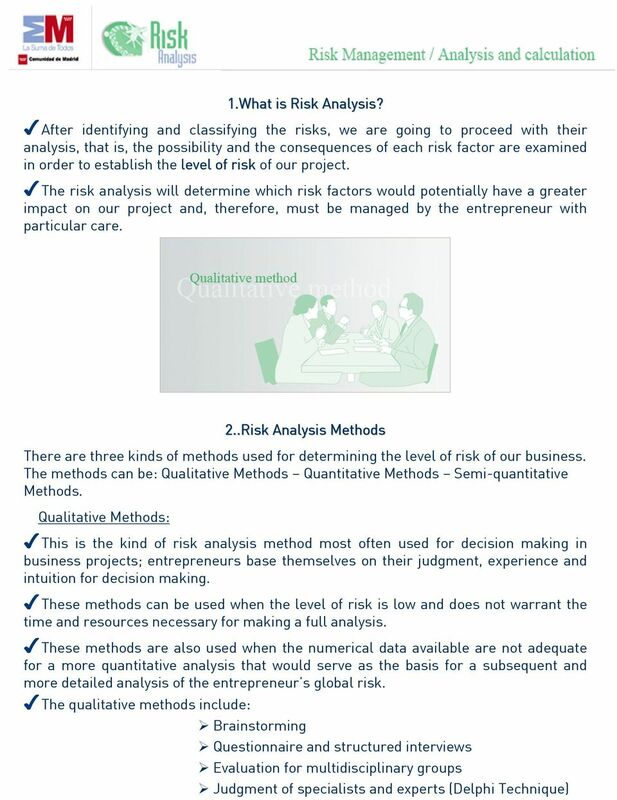 Download "Risk Analysis and Quantification"
1 Risk Analysis and Quantification 1 What is Risk Analysis? 2. 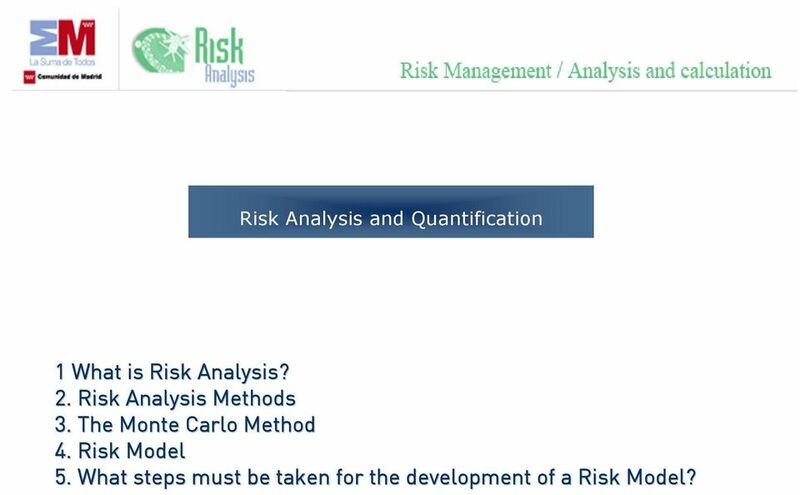 Risk Analysis Methods 3. The Monte Carlo Method 4. 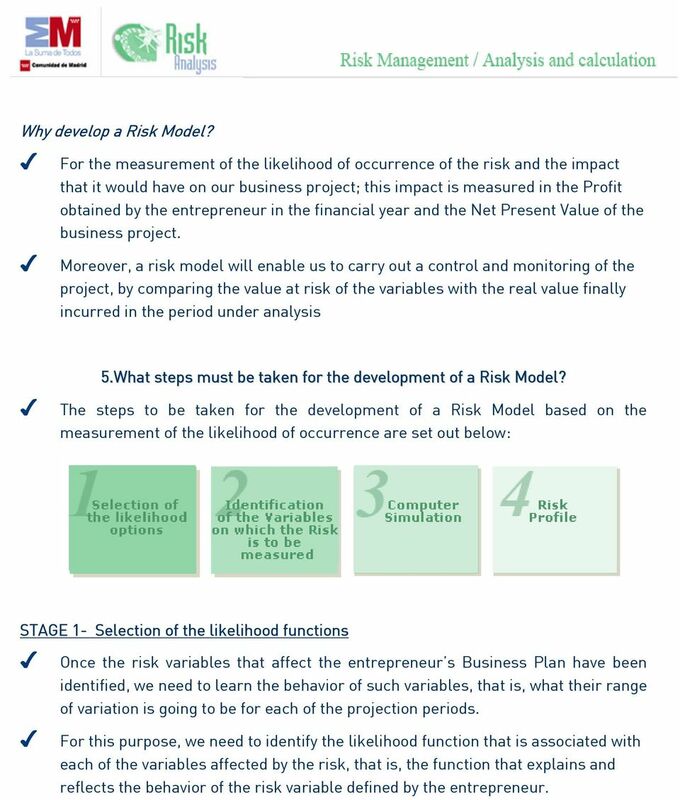 Risk Model 5. What steps must be taken for the development of a Risk Model? 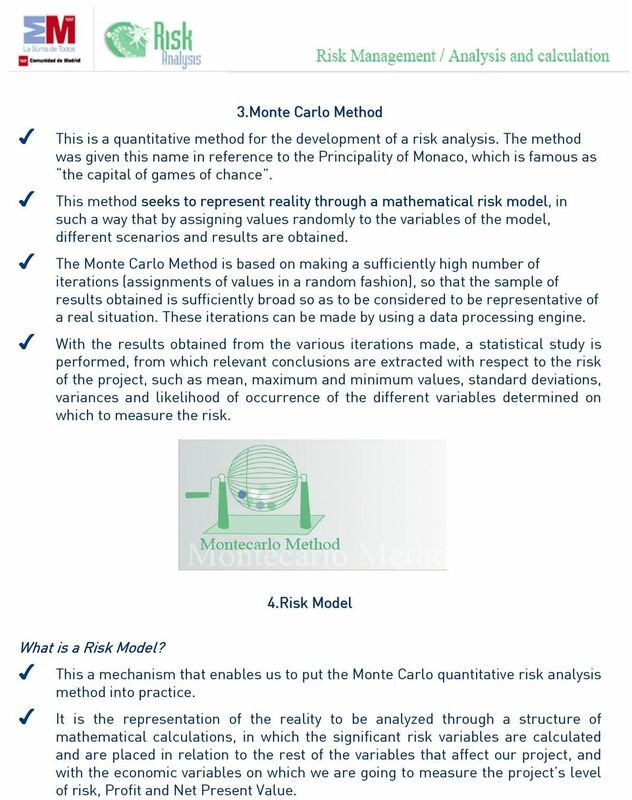 4 3.Monte Carlo Method This is a quantitative method for the development of a risk analysis. The method was given this name in reference to the Principality of Monaco, which is famous as the capital of games of chance. This method seeks to represent reality through a mathematical risk model, in such a way that by assigning values randomly to the variables of the model, different scenarios and results are obtained. The Monte Carlo Method is based on making a sufficiently high number of iterations (assignments of values in a random fashion), so that the sample of results obtained is sufficiently broad so as to be considered to be representative of a real situation. These iterations can be made by using a data processing engine. With the results obtained from the various iterations made, a statistical study is performed, from which relevant conclusions are extracted with respect to the risk of the project, such as mean, maximum and minimum values, standard deviations, variances and likelihood of occurrence of the different variables determined on which to measure the risk. 4.Risk Model What is a Risk Model? 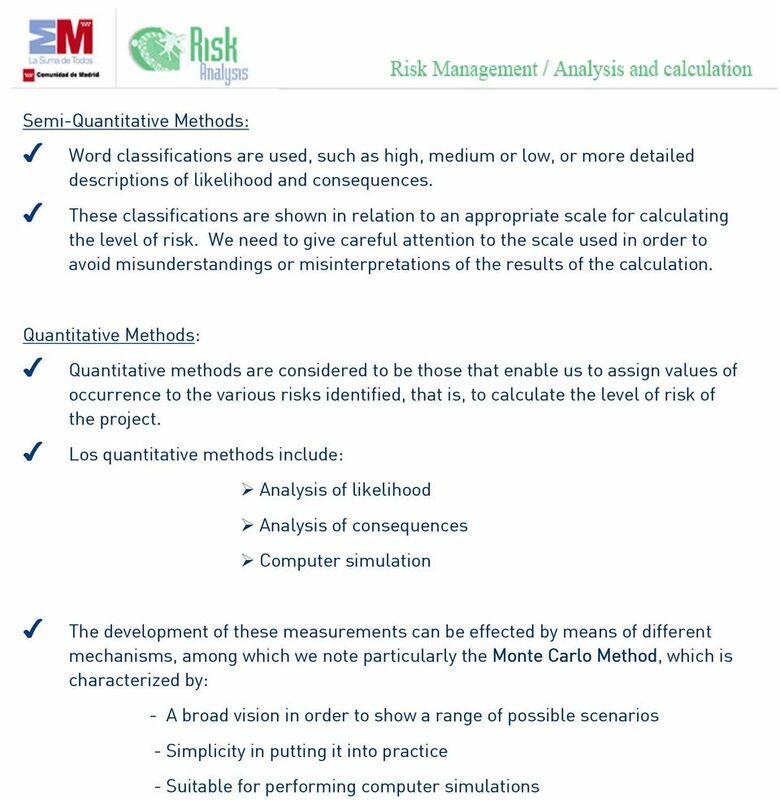 This a mechanism that enables us to put the Monte Carlo quantitative risk analysis method into practice. It is the representation of the reality to be analyzed through a structure of mathematical calculations, in which the significant risk variables are calculated and are placed in relation to the rest of the variables that affect our project, and with the economic variables on which we are going to measure the project s level of risk, Profit and Net Present Value. 5 Why develop a Risk Model? 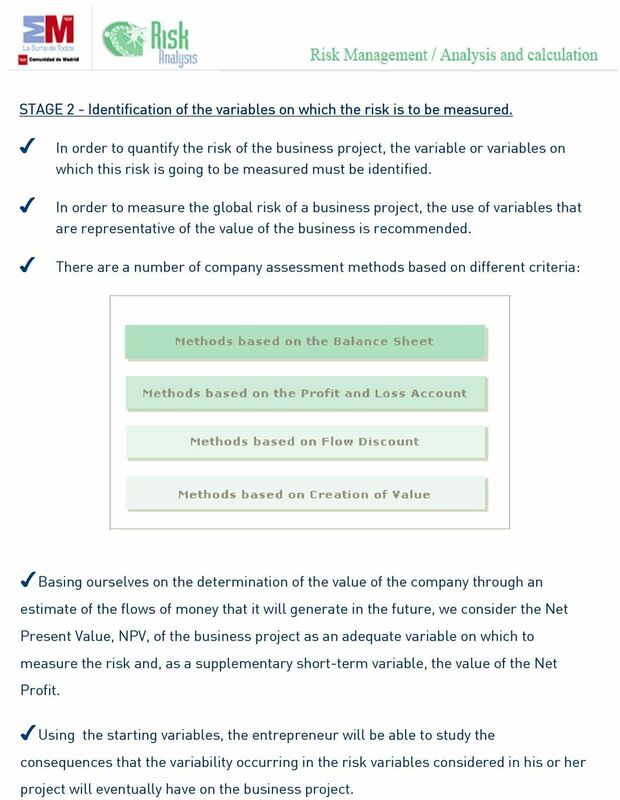 For the measurement of the likelihood of occurrence of the risk and the impact that it would have on our business project; this impact is measured in the Profit obtained by the entrepreneur in the financial year and the Net Present Value of the business project. 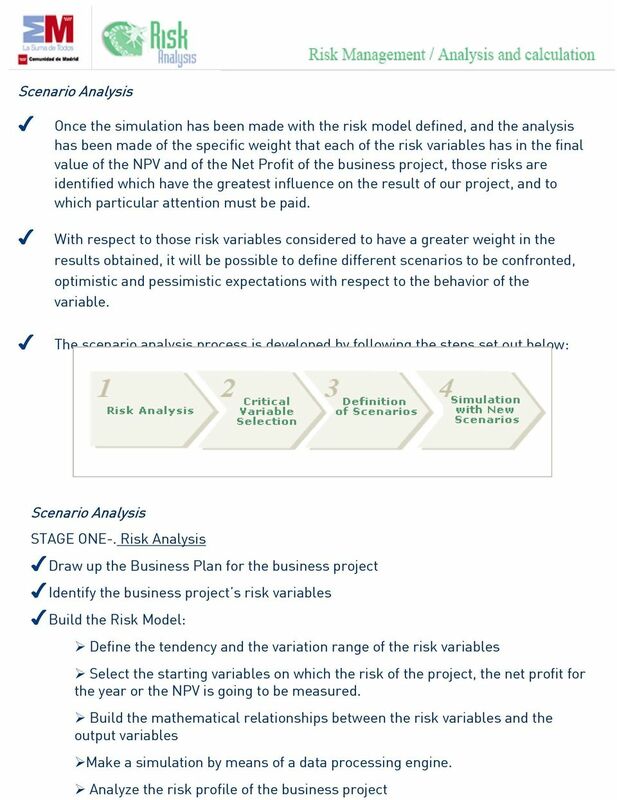 Moreover, a risk model will enable us to carry out a control and monitoring of the project, by comparing the value at risk of the variables with the real value finally incurred in the period under analysis 5.What steps must be taken for the development of a Risk Model? 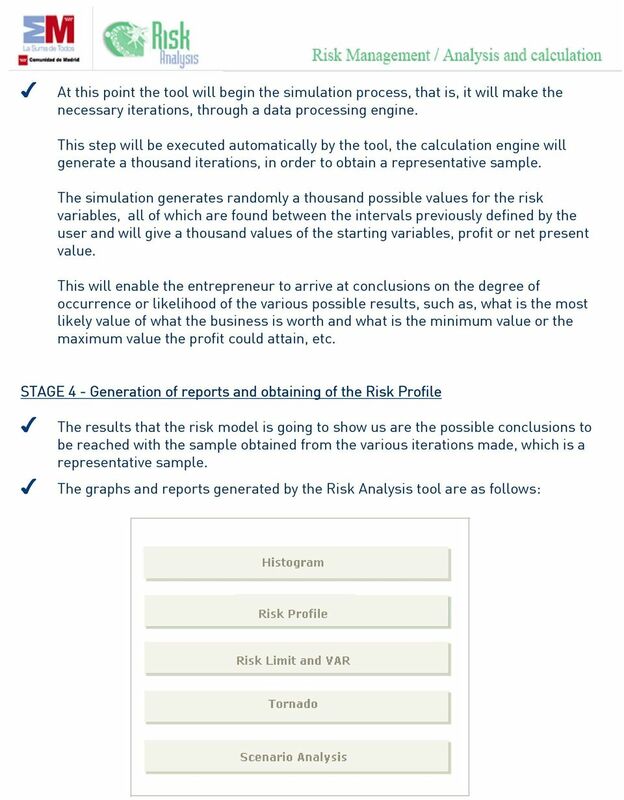 The steps to be taken for the development of a Risk Model based on the measurement of the likelihood of occurrence are set out below: STAGE 1- Selection of the likelihood functions Once the risk variables that affect the entrepreneur s Business Plan have been identified, we need to learn the behavior of such variables, that is, what their range of variation is going to be for each of the projection periods. For this purpose, we need to identify the likelihood function that is associated with each of the variables affected by the risk, that is, the function that explains and reflects the behavior of the risk variable defined by the entrepreneur. 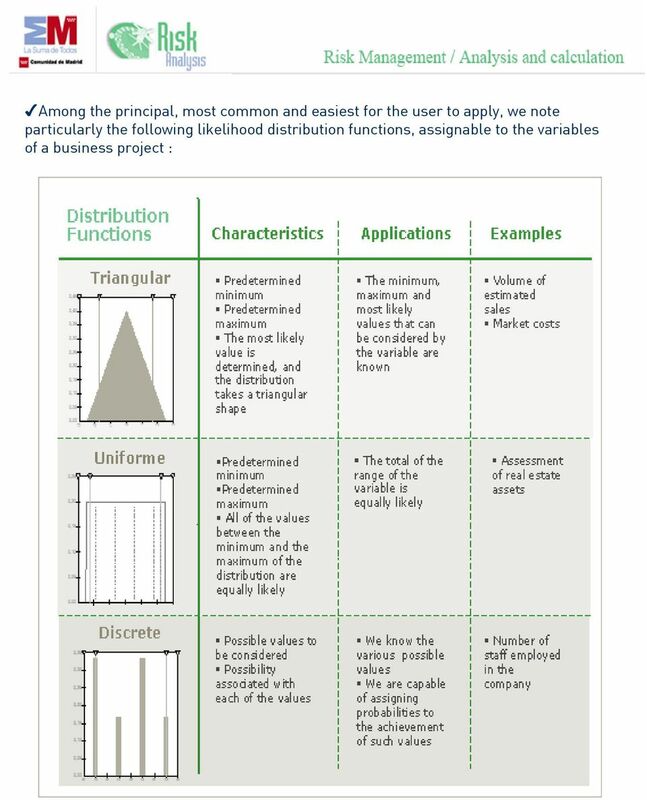 7 Once the distribution functions have been analyzed, we identify those we consider to be most in line with the risk variables selected by the entrepreneur, because these will be the ones that best describe and reflect the behavior of the variable. 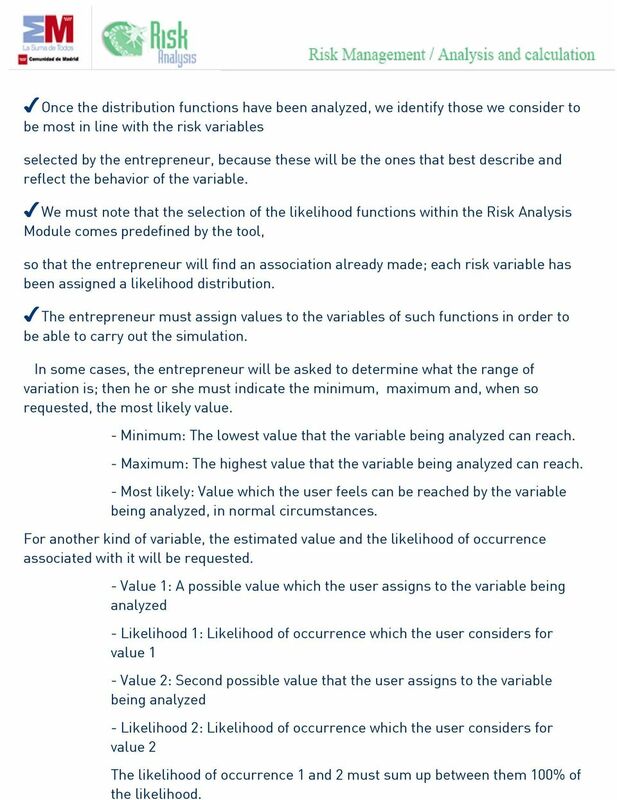 We must note that the selection of the likelihood functions within the Risk Analysis Module comes predefined by the tool, so that the entrepreneur will find an association already made; each risk variable has been assigned a likelihood distribution. The entrepreneur must assign values to the variables of such functions in order to be able to carry out the simulation. In some cases, the entrepreneur will be asked to determine what the range of variation is; then he or she must indicate the minimum, maximum and, when so requested, the most likely value. - Minimum: The lowest value that the variable being analyzed can reach. - Maximum: The highest value that the variable being analyzed can reach. - Most likely: Value which the user feels can be reached by the variable being analyzed, in normal circumstances. For another kind of variable, the estimated value and the likelihood of occurrence associated with it will be requested. - Value 1: A possible value which the user assigns to the variable being analyzed - Likelihood 1: Likelihood of occurrence which the user considers for value 1 - Value 2: Second possible value that the user assigns to the variable being analyzed - Likelihood 2: Likelihood of occurrence which the user considers for value 2 The likelihood of occurrence 1 and 2 must sum up between them 100% of the likelihood. 8 STAGE 2 - Identification of the variables on which the risk is to be measured. In order to quantify the risk of the business project, the variable or variables on which this risk is going to be measured must be identified. In order to measure the global risk of a business project, the use of variables that are representative of the value of the business is recommended. There are a number of company assessment methods based on different criteria: Basing ourselves on the determination of the value of the company through an estimate of the flows of money that it will generate in the future, we consider the Net Present Value, NPV, of the business project as an adequate variable on which to measure the risk and, as a supplementary short-term variable, the value of the Net Profit. Using the starting variables, the entrepreneur will be able to study the consequences that the variability occurring in the risk variables considered in his or her project will eventually have on the business project. 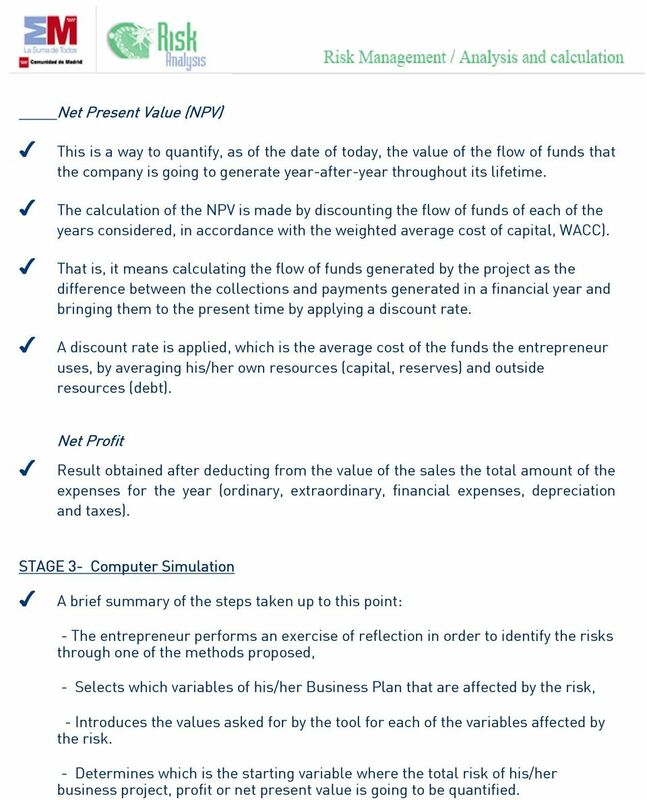 9 Net Present Value (NPV) This is a way to quantify, as of the date of today, the value of the flow of funds that the company is going to generate year-after-year throughout its lifetime. The calculation of the NPV is made by discounting the flow of funds of each of the years considered, in accordance with the weighted average cost of capital, WACC). That is, it means calculating the flow of funds generated by the project as the difference between the collections and payments generated in a financial year and bringing them to the present time by applying a discount rate. A discount rate is applied, which is the average cost of the funds the entrepreneur uses, by averaging his/her own resources (capital, reserves) and outside resources (debt). Net Profit Result obtained after deducting from the value of the sales the total amount of the expenses for the year (ordinary, extraordinary, financial expenses, depreciation and taxes). STAGE 3- Computer Simulation A brief summary of the steps taken up to this point: - The entrepreneur performs an exercise of reflection in order to identify the risks through one of the methods proposed, - Selects which variables of his/her Business Plan that are affected by the risk, - Introduces the values asked for by the tool for each of the variables affected by the risk. - Determines which is the starting variable where the total risk of his/her business project, profit or net present value is going to be quantified. 11 Histogram Reports on the possible values to be taken by the output variables of the model (net profit and net present value) and the likelihood associated with each of them. The Histogram shows the possible values of the net profit or of the NPV of the business project that can be obtained with a certain level of confidence (likelihood of occurrence associated with value). 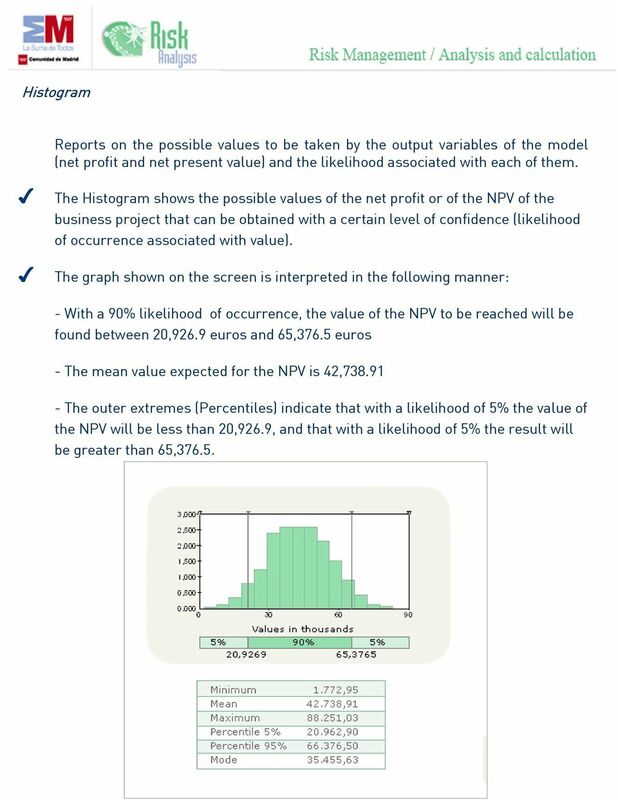 The graph shown on the screen is interpreted in the following manner: - With a 90% likelihood of occurrence, the value of the NPV to be reached will be found between 20,926.9 euros and 65,376.5 euros - The mean value expected for the NPV is 42, The outer extremes (Percentiles) indicate that with a likelihood of 5% the value of the NPV will be less than 20,926.9, and that with a likelihood of 5% the result will be greater than 65,376.5. 12 Risk Profile The graph shows what could constitute the risk profile curve of a particular asset, company, region, etc., with respect to the risks affecting the NPV or the net profit. The tool will enable you to obtain a vision of the risk that will facilitate optimum decision-making at all times throughout the life cycle of your business project. The graph shown on the screen is interpreted in the following manner: - It is a technique for calculating and visualizing all of the results of your business, taking into account the uncertainties and accrued likelihoods of occurrence - Axis X is the entire range of values of the result - Axis Y is the accrued likelihood of occurrence - The riskier the business, the broader the range of possible results, giving rise to a more horizontal curve. As the curve becomes more vertical, the uncertainty associated with the project lessens. 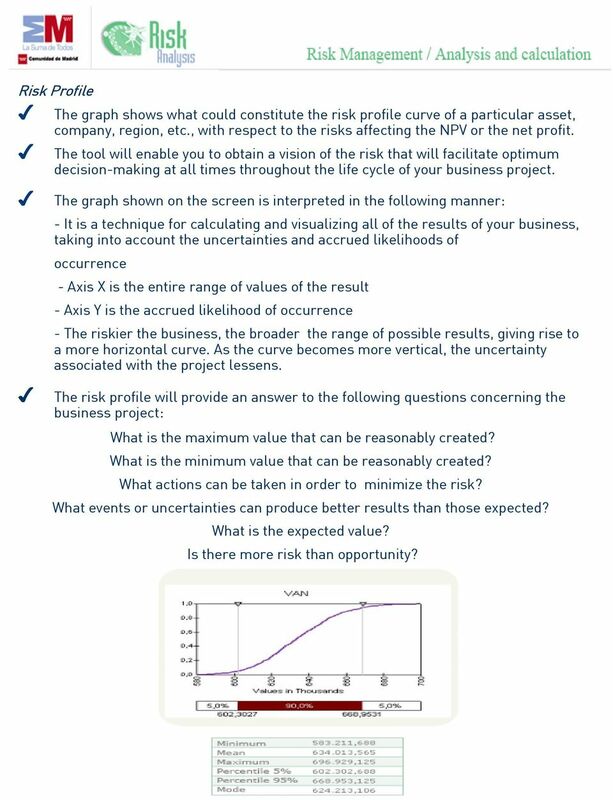 The risk profile will provide an answer to the following questions concerning the business project: What is the maximum value that can be reasonably created? What is the minimum value that can be reasonably created? What actions can be taken in order to minimize the risk? What events or uncertainties can produce better results than those expected? What is the expected value? Is there more risk than opportunity? 13 VAR The VAR, or Value at Risk, is a measurement for the quantification of a risk. The VAR is a method for quantifying risk that measures the worst loss expected by the entrepreneur during a period of time, under normal market conditions and with a given confidence level. For example, if it is found that the annual VAR of a business project is 1 million euros with a 95% confidence level, it means that there are only five possibilities among 100, under normal market conditions, that a loss in excess of one million euros could occur. This figure alone sums up the exposure of a business project to the market risk under normal conditions, without considering extreme situations that could occur in the market in which the entrepreneur operates. The VAR is useful for a number of purposes: - Presentation of the information. It is useful as a measurement for assessing risks and provides greater transparency in the monitoring and control of risks. - Allocation of resources. It can be used in order to decide where the resources can best be applied. - Performance assessment. It can be used to adjust the performance as per risk and avoid taking an extra risk when managing a business. 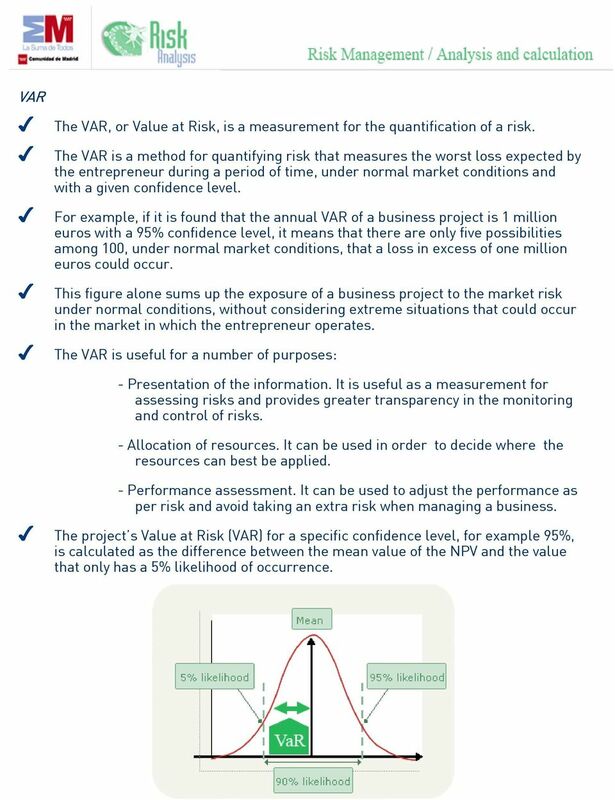 The project s Value at Risk (VAR) for a specific confidence level, for example 95%, is calculated as the difference between the mean value of the NPV and the value that only has a 5% likelihood of occurrence. 14 Tornado A sensitivity analysis makes it possible to identify the risks factors that involve the greatest risk for the success of the business plan The Tornado is a graph that informs the entrepreneur of those risk variables that will have a greater impact on his/her business plan. This graph indicates the range of variation of the company s value, NPV, for each of the risk variables, assuming that a variation has occurred in the said variable, with the rest of the risk variables remaining unchanged. That is, it represents how much the NPV changes in the face of variations in each of the risk variables, with the rest of the variables remaining constant. This process will be repeated for each of the variables, generating the graph shown below as the result. 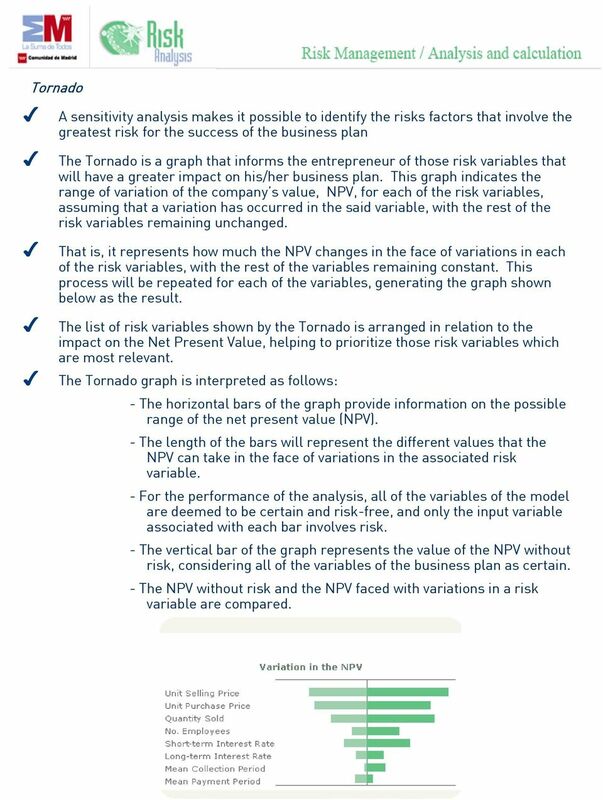 The list of risk variables shown by the Tornado is arranged in relation to the impact on the Net Present Value, helping to prioritize those risk variables which are most relevant. The Tornado graph is interpreted as follows: - The horizontal bars of the graph provide information on the possible range of the net present value (NPV). - The length of the bars will represent the different values that the NPV can take in the face of variations in the associated risk variable. - For the performance of the analysis, all of the variables of the model are deemed to be certain and risk-free, and only the input variable associated with each bar involves risk. - The vertical bar of the graph represents the value of the NPV without risk, considering all of the variables of the business plan as certain. - The NPV without risk and the NPV faced with variations in a risk variable are compared. 16 STAGE TWO-. 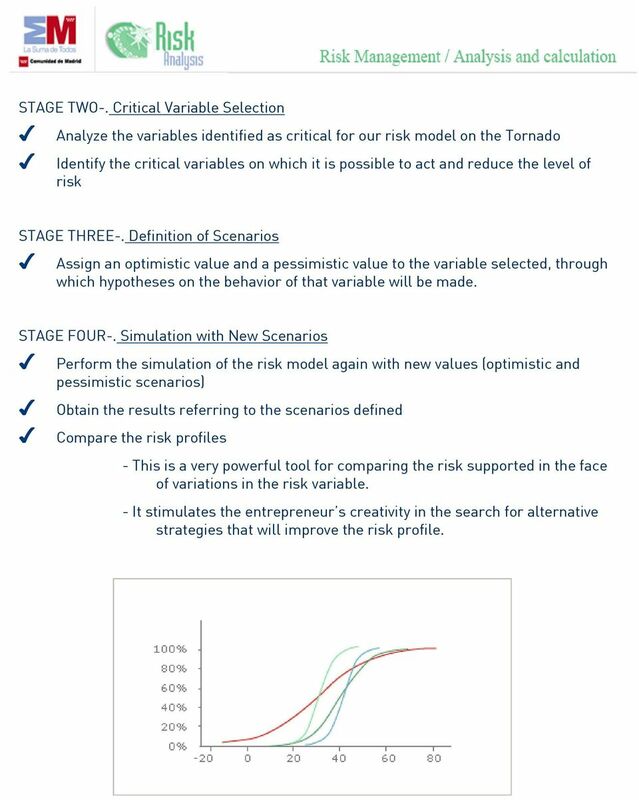 Critical Variable Selection Analyze the variables identified as critical for our risk model on the Tornado Identify the critical variables on which it is possible to act and reduce the level of risk STAGE THREE-. Definition of Scenarios Assign an optimistic value and a pessimistic value to the variable selected, through which hypotheses on the behavior of that variable will be made. STAGE FOUR-. Simulation with New Scenarios Perform the simulation of the risk model again with new values (optimistic and pessimistic scenarios) Obtain the results referring to the scenarios defined Compare the risk profiles - This is a very powerful tool for comparing the risk supported in the face of variations in the risk variable. - It stimulates the entrepreneur s creativity in the search for alternative strategies that will improve the risk profile. Financial Risk Assessment Part I.1 Dimitrios V. Lyridis Assoc. Prof. National Technical University of Athens DEFINITION of 'Risk The chance that an investment's actual return will be different than expected. Monte Carlo analysis used for Contingency estimating. Buy-back Contract Risk Modeling Using System Dynamics Jan Wright (jan.wright@ah.telia.no) ToBeDecided AS, 1397 Nesøya, Norway Arne-Helge Byrknes (abyrknes@pbs.no) Paradigm Development AS, C. Sundtsgt. FINANCIAL RISK EVALUATION BY THE TREE OF PROBABILITY DECISIONS METHOD Mariya Bruseva Varna Free University, Bulgaria mariya.bruseva@gmail.